If she had a magic wand, BYU nursing alum Holly Willardson Christensen (BS ’06) would wipe out cancer. Short of that kind of magic, though, she has whipped up her own brand of bippity-boppity-boo to help kids battling cancer smile again. 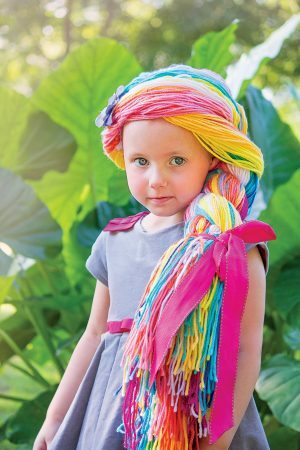 Through her nonprofit, the Magic Yarn Project, Christensen gifts whimsical princess and pirate wigs to girls and boys who lose their hair during chemotherapy treatments. Less than a year since Christensen made her first yarn wig in her Palmer, Alaska, apartment, the project has garnered national media attention, built a community of contributors that spans the globe, and sent some 700 wigs to individual kids and cancer centers in 14 countries. Children who lose their hair while undergoing cancer treatments can choose one of many varieties of princess or pirate wigs to wear. Photo courtesy the Magic Yarn Project. She sees evidence of that in happy, smile-filled snapshots of recipients wearing one of seven styles—Rapunzel and Elsa the clear favorites. Her photo album includes pictures of the little girl who started it all. It began when Christensen, a mother of three, learned that the daughter of her former BYU nursing classmate Rachel Gammon Mecham (BS ’06) had lymphoma cancer. The same way she made the costume wigs, Christensen took a soft crocheted beanie, threaded in baby-blanket-soft yarn to fashion a long blond braid, and sent it off. The wig arrived shortly after the Mechams learned their daughter had relapsed—the cancer was back. “Our daughter put it right on,” recalls Mecham. “She wanted to put on one of her princess dresses with it. And she went outside in the grass to twirl.” After seeing her daughter spend 80 nights in the hospital over seven months, this sight was a boost, Mecham says, to herself as a parent as much as it was to her daughter. The little girl who started it all (unnamed at her mother’s request). When she received her wig, she put it on, along with a princess dress, and went outside to twirl. “I know there are angels seen and unseen watching over us in our trials,” writes her mother, Rachel Mecham. “Holly is providing tender mercies for so many others like my daughter.” Photo courtesy of the Magic Yarn Project. Thanking Christensen, Mecham added, “I bet a lot of little girls at our hospital would love that.” And the seed was planted. The local hospital, Christensen thought, might want a few wigs. As a member of her ward Relief Society presidency, she put together a wig-making activity with her ward sisters, putting out a public call for yarn donations on Facebook. Hundreds of requests for wigs poured in, as did offers to donate money, supplies, and time. The last eight months have been a frenzy of community workshops—most held in LDS chapels. Christensen put up online tutorials for knitters to contribute remotely, as far off as Australia and Scotland. She even enlisted a crocheting group at the local women’s prison. An inmate at Alaska’s Hiland Mountain Correctional Center crochets a beanie for the Magic Yarn Project. The project shares tutorials to involve interested volunteers—from Relief Society sisters to prison crocheting groups. Photo courtesy Massachusetts General Hospital Cancer Center Everyday Amazing Project. According to Karla Hicks, the social worker who oversees this group at the Hiland Mountain Correctional Center, the inmates “seek to participate in the project”—they work their way up to the elite group of crocheters. “While the ladies are working, you can hear laughter, singing,” she continues. “There is no time for them to feel sorry for themselves because of the poor choices they made in the past. They are working on a gift for a child who didn’t choose to have cancer or to to loose their hair.” The female inmates say it’s been a source of motivation and purpose, says Christensen, who is headed back to the prison this week to teach them how to make the new Jack Sparrow wigs. Christensen will take all the help she can get. A wig runs $20—more to ship. And she’s besieged with requests. And yarn. “Our garage has become the Magic Yarn warehouse,” she says—it’s walled in by colorful skeins. They park the cars outside (never mind 20-below Alaskan-winter lows). Nurse Holly Christensen, inspired by the struggles of her former nursing classmate’s young daughter with lymphoma, created a nonprofit that creates wigs for children with cancer. It is now active in 23 countries. Photo courtesy Massachusetts General Hospital Cancer Center Everyday Amazing Project. The project has been covered by Upworthy, ABC News, Huffington Post, Oprah’s O magazine—the list goes on. And it was recently honored at the One Hundred Gala, a cancer-research fundraising event hosted by Massachusetts General Cancer Center. 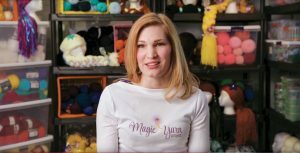 Find more information, tutorials, and details on how to help at themagicyarnproject.com. 1 of 11: Princess Adalyn. Photo courtesy the Magic Yarn Project. 2 of 11: Princess Kira. Photo courtesy the Magic Yarn Project. 3 of 11: Princess Khaniyah. Photo courtesy the Magic Yarn Project. 4 of 11: Princess Emma Rae. Photo courtesy the Magic Yarn Project. 7 of 11: Princess Lillian. Photo courtesy the Magic Yarn Project. 8 of 11: Princess Isabelle. Photo courtesy the Magic Yarn Project. 9 of 11: The Magic Yarn Project "Elsa" wig. Photo courtesy the Magic Yarn Project. This BYU alumna has created a universal symbol to help raise skin cancer awareness.